I keep waiting for Jude Law to get old and he never does. And I mean in that in two different ways. The guy never seems to age, keeping those English good looks well into his 40s. For this role it looked like the makeup department was trying desperately to make him look less attractive, more like a shmoe, and that’s just not happening. Also, I just never get tired of the guy. He’s been a Hollywood mainstay since the late 90s, attacking the screen with role after role, and although you could say that he may have gone through a slump in the late 2000s, there’s no denying his continual star power. 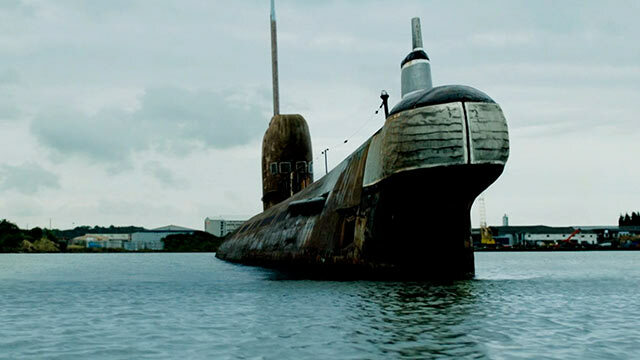 Law is back on track in this submarine thriller, a film that won’t go down in history as a beautiful piece of cinema, but one whose inherent drama can’t be denied and just might be a nice springboard for another decade of solid Jude Law. Having just been fired from his salvage job where he piloted a submarine for a large corporation, Robinson has limited options. His wife left him for a rich man, his son is off at a private school, and his severance & unemployment will only keep him afloat for so long. So when Robinson hears of a potentially lucrative, though illegal, submarine job, he’s ready to do whatever it takes. During WWII, a cache of gold was lost while being delivered from Russia to Germany. It’s recently been located, sunk in a submarine on a ledge near the bottom of the Black Sea, but political squabbles are keeping anyone from claiming it. If Robinson can find a crew and a financier, he & his team will secretly go deep, retrieve the gold, and become rich men, right under the nose of the government. But it won’t be easy, as the team of half Brits/half Russians don’t get along, their submarine is a piece of junk, and enough gold can make any man greedy for more. I was afraid, going into this movie, that Jude Law was going to play a Russian. Now, he’s done it before with a ton of success; Enemy at the Gates happens to be one of my personal favorites, although critics don’t give it a lot of credit. But what they did in that film was just have everyone speak with British accents. I know, it sounds weird, but by having everyone speak as themselves it allowed audiences to hide behind the fourth wall, accept that these actors are meant to be Russians without the accents, which I’m sure was actually for our benefit. 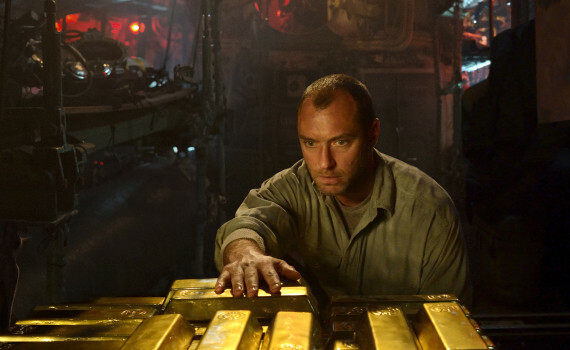 Ironically, there is a character in Black Sea named Zaytsev, which was Jude Law’s character’s last name in EATG, but I digress. The point is, in this film, thankfully, Law was a Brit, though a Scot, judging from the dialect, avoiding the accented disaster that this movie could have been. Harrison Ford played an accented Russian in K-19: The Widowmaker with limited success, though I have to admit, I kinda liked that movie. That’s the thing with these submersible thrillers; they’re likeable despite themselves. K-19, Crimson Tide, The Hunt for Red October; there is something inherent in the claustrophobic danger of the sub, a drama that presses down on us from all sides in a way we can’t avoid. Americans are fascinated by military films anyway; put us underwater and we freak out, but in a good way. 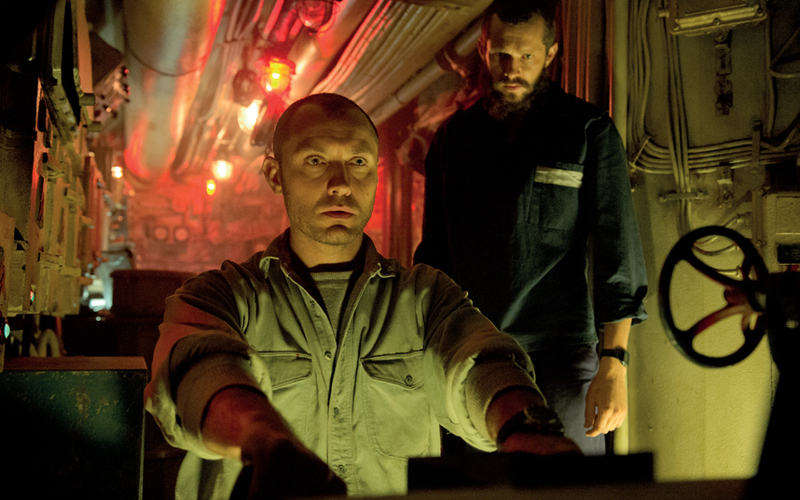 What Black Sea was able to do well was to produce a submarine movie that didn’t need ranks and salutes. It became a gritty, realistic, bumbling mess that you could imagine of bunch of greedy idiots getting themselves into. Law was cool as the captain of the vessel, McNairy was slimy as the lone American on board, and Mendelsohn is a strong though little-known actor. Speaking of little-known, keep an eye on Grigoriy Dobrygin, an up-and-coming Russian actor who I first saw in A Most Wanted Man and who I think we’ll be seeing a lot of in the coming years. Taken as a whole, Black Sea was your run-of-the-mill underwater action movie. It was well done but constrained, never a film that was going to amaze, but a solid movie that is at times very tense, occasionally humorous, and pretty entertaining, despite being imperfect.